NYTimes, Gmail, Facebook, Twitter. These are four websites I visit the most. Every time I need a mental break, I tap “n,” “f,” “t,” into the browser URL and with one pinky action I kill some time. It occurs to me that these handful of websites dominate the namespace of the URL autofill. I was curious to see what my present alphabet of websites look like. I’m most surprised by “c,” “h,” “p,” “r,” “u,” on my list. I guess I rarely visit websites starting with those letters. These are notes and excerpts I took directly from the short book, True Love, from Thich Nhat Hanh. I am a novice to meditation, and the practice of mindfulness. This book is a wonderful introduction. I received this book as a gift from a special person in my life. The timing couldn’t have been better. I wanted to share these notes with my dearest friends—my sangha. In order to love, we have to be mindful and present, and communicate that energy to our loved ones. Taking refuge in the sangha is important. The sangha is a practice community in which brothers and sisters in the Dharma practice the cultivation of mindfulness daily: eat, drink, wash dishes, work in gardens, drive—and not just during times of sitting meditation. The are four aspects of love that we can attain through mindfulness. There are also four mantras to keep in mind. I dreamed about my dad. It was like a movie reel through time. I saw him clearly. I saw how he interacted with his friends, his golf buddies. He was generous with the younger guys. He tried to give them advice. He gave a young man some pocket money to go out and enjoy dinner with his friends. I was sitting there, a kid, observing at the table side. Like I often did when I was little amongst adults. I saw other people I knew in flashbacks; 20 years younger. I saw my aunt and uncle and myself circa 1990s; grainy imagery. Through the dream, my father’s features changed. I watched him as he aged and his hair turned silver. Through it all he was his animated self, full of life! Only older, but he was never less authoritative. This dream began and ended with me picking up his medical records. I spoke to a nurse for a moment before tears came down my chins. A good cry. He was a passionate giver and a prolific producer. He had one of the strongest work ethics and he always smiled. His work was his passion. He wore his belief on his sleeves. He was stubborn and lived by his principles. He could be abrasive, misunderstood, and controversial. People who understood his tenacity loved him; everything he did was out of passion. He made friends and foes alike as an artist. He also wanted to share this passion with everyone; he was a teacher, a researcher, an author, an architect, a public servant. Sam Altman talks about how important it is to have momentum. In the last few months since we started working on MagicBus, we’ve felt the momentum swings. I think momentum comes from building off of different small wins. Sometimes I feel like I am in a slump and fall behind on emails; things just don’t feel right. The only way to fight this slump is to face everything head on. We have a task list. I find that ticking things off the list everyday is a great way to gain momentum. Getting to inbox zero is also another way to get back the momentum. Sometimes I discover a great gem in the pile of emails. and I wish I had seen it sooner. More often than not, momentum comes from our customers. When I see how excited they get, I know we are onto something really important, and that feels great. Today I had a lackluster product experience through BloomNation. I selected same-day delivery and picked a great looking bouquet. The flowers never got delivered because the florist did not have cornucopia in stock as part of the arrangement. I got an email at the end of the day and was told that the last delivery truck had left. It was really a bummer to my entire experience because the florist said she’d left two voicemails earlier in the day—and I wished she or the system had emailed before the truck left. She was professional, but this brought up an interesting misalignment in priorities as a customer and a vendor. I decided to start writing again. I should write everyday, and even just for 15 minutes. A couple of years ago I wrote everyday for 15 minutes. Sometimes I got really into the blog post, and ended up writing for 40 minutes to 2 hours. Sometimes I quit after 10 minutes because no juice was flowing. Hiten Shah recently started writing everyday for 30 days on his blog. It was a personal challenge from Om Malik. I decided it was time for me to start writing everyday again. The most prolific bloggers that I know, write everyday to practice (Jamie Lin, Andrew Parker). Jamie recently commented on this to me, on a days of not writing—they are opportunities lost from connecting with new users and readers. Since the new Digg Reader came out I have been hugely impressed by the work and attention to details. My loyalty grew partly because of how responsive Michael Young, its CTO, has been. He responded to my tweets when I least expected it, consistently. This was the surprise factor that brought delight. 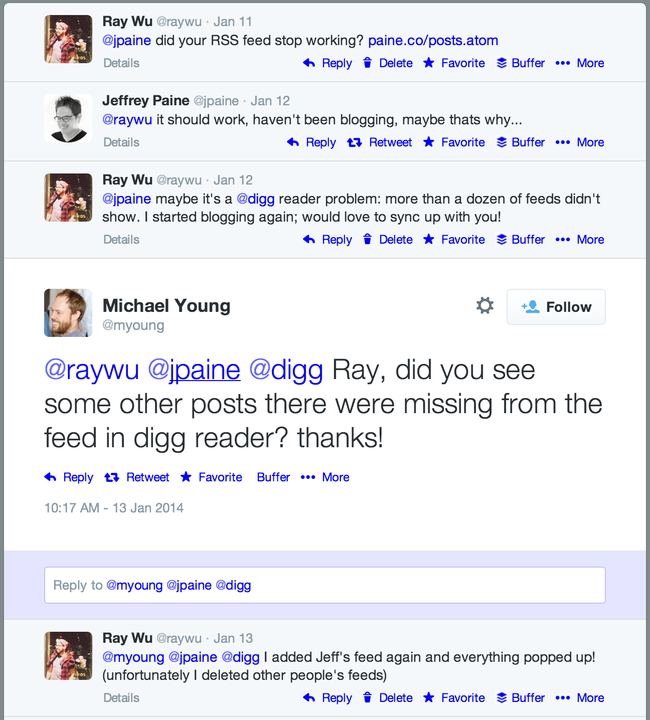 Here are two separate occasions when Michael Young responded to me about my RSS frustrations. 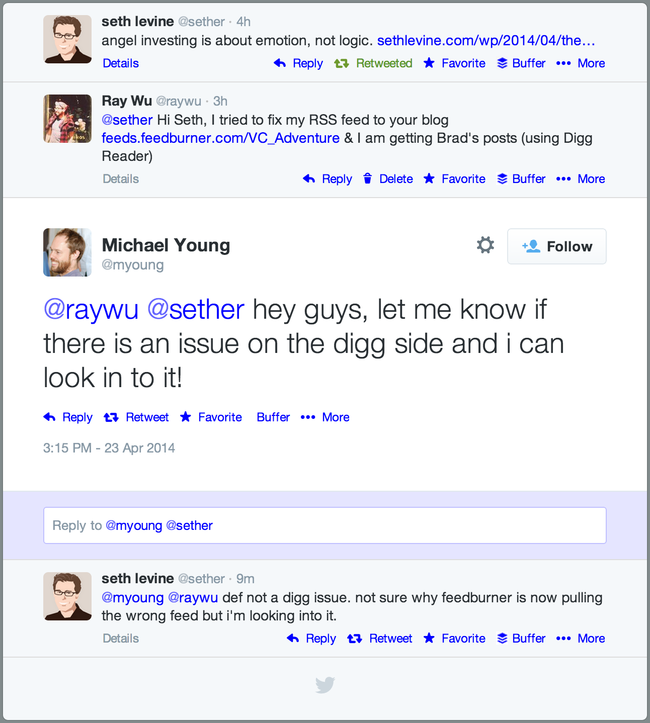 When my RSS feed didn’t work, I didn’t think it was Digg Reader’s fault at all. But it was Michael Young’s personal touch that gained my attention and made me love the product. Lucas Carlson put himself out on the web (I respect that a lot) and challenge the usefulness of incubator and accelerator programs. What seems to be “busy work” at incubators sometimes do amount to nothing. I’d like to share this with the incoming companies at JFDI.Asia (disclaimer: I manage the accelerator program) as a reminder of what not to do (endless hours of intro meetings with mentor whiplash) and what to seriously focus on (spend time with customers, focus on OKM, and on building and testing the product). Here are a couple of articles that stood out for me in the last few weeks. I have been thinking a lot about what it means to be a leader. These three pieces all touch on the topic. All three point to the essentiality of humility in a leader, in recognizing when to lead, and when to step down.